HomeWhat are we doing to improve hospital room cleaning and disinfection? What are we doing to improve hospital room cleaning and disinfection? I gave a webinar last week for 3M (you can download my slides here) on “Your hospital room can make you sick: How improved cleaning and disinfection can help”. 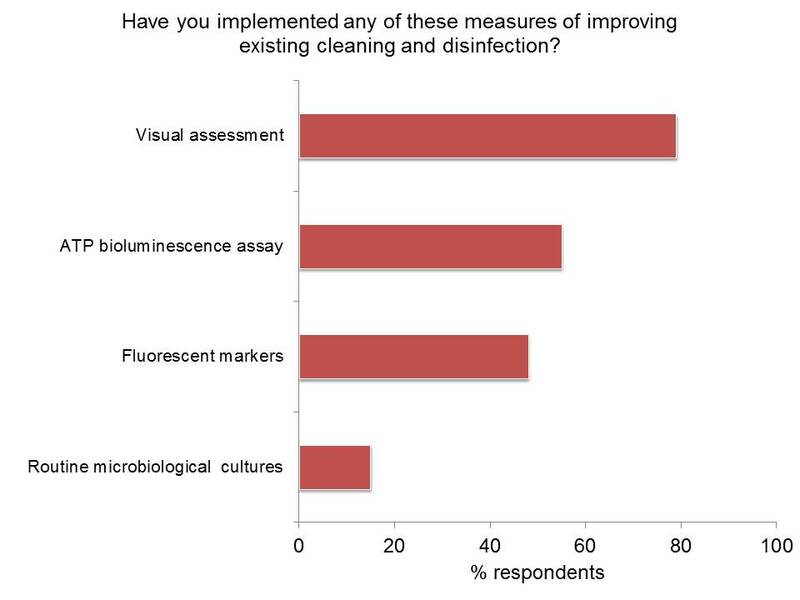 I asked the audience what they were doing to improve cleaning and disinfection, and thought I would share the findings. I don’t know the exact size of the audience (but it’s usually a couple of hundred mainly US based IPC folks), and the audience were allowed to choose any answers that applied to them for the second two questions. I was surprised that so many people chose contaminated hands as the most important reservoir. I appreciate that this is received wisdom, but I really do think that this depends on pathogen and context. If you are looking at ‘same room’ acquisition of A. baumannii then contaminated surfaces are the most important reservoir, even if contaminated hands are the ‘terminal event’ in the chain of transmission. Over 80% of the respondents had some sort of system for visual assessment of cleanliness – but what are the other 20% doing? Surely we need mechanisms in place to ensure that hospital rooms are visibly clean (although it’s important to understand that this may not necessarily correlate with microbiological contamination level). Around half of hospitals were using a measure of cleaning performance (either ATP or fluorescent markers), which seems to be the way forward in providing some objectivity in performance managing the cleaning process. And it was interesting to see that 15% of respondents had gone down the route of routine microbiological cultures. I’d like to do this – I really would – but I am not sure whether there is room for ATP / fluorescent markers and routine microbiological cultures in the same programme (correct me if I’m wrong here please readers!). Finally, I was surprised to see over 80% of hospitals had implemented disinfectant wipes. I’d love to see what types of wipes there are – QAC? Sporicidal wipes? Over half had also made a change in disinfectant in their attempts to improve hospital cleaning and disinfection, and a little under half had implemented chlorhexidine bathing. 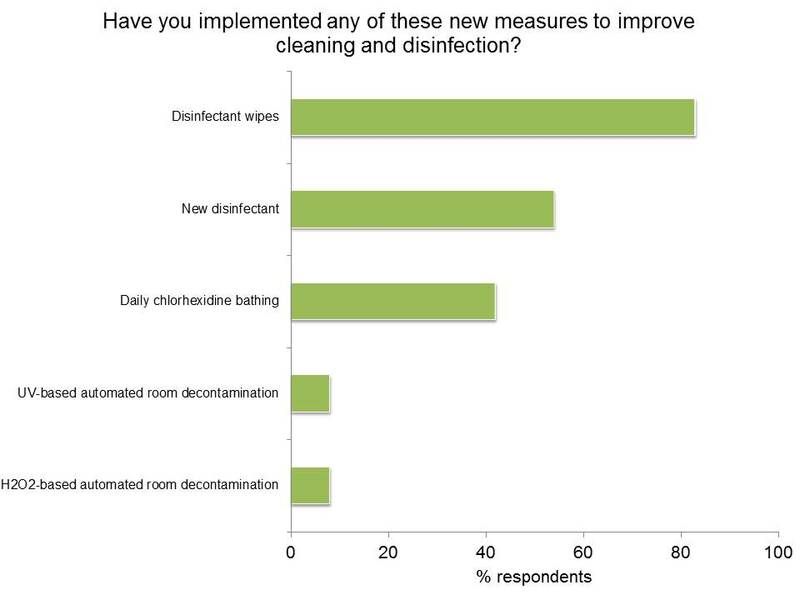 I was a bit disappointed to see that <10% of respondents had implemented automated room decontamination, which I see as part of the future of hospital cleaning and disinfection. Any reflections on this reflection welcome, as always. ← Why are we not using existing data for healthcare-associated infection surveillance? Seems as though the environment is getting more attention as it should. Just not sure how effective the disinfectants are on ALL surfaces (hard/soft) and if all the wipes are doing is simply spreading the bacteria around the room (bed, mattress, etc). Manual cleaning will still leave a trail of variability regardless of the solution. Thanks for focusing on the issue! Maybe the difference between choosing a disinfectant wipe or automated room decontamination, is asking if it is with or without a patient. Over here in California there is a huge surge in “upgrading” ORs, ICUs and ERs as part of the efforts to cut HAI rates. Another initiative is an effort to instigate higher level training for personnel involved with cleaning, such as a proposed Certification Program for EVS personnel. These are all expensive initiatives, but in a Post Antibiotic Era are they going to be effective? Probably not if all do is change the “characters” and the “props” but not the “playbook”Changing disinfectants I see as perhaps providing a proverbial “10 mins of Joy” but ultimately its much of the same that we have been doing for decades and ultimately runs the risk of contributing to ongoing pathogen resistance to such cleaning chemistry. UV has a lot of inherent problems and is really only effective to the degree to which it is when introduced after a disinfection / cleaning protocol has been undertaken. All these measures have a couple of fundamental flaws, especially as long term solutions. The First Problem as I see it is that they are all aimed at “Killing Everything”; the good, beneficial bacteria as well as the harmful pathogens. We need the good; killing both creates an un-natural and unsustainable vacuum and Nature abhors a vacuum. The Second Problem is that none offer any ongoing protective / preventative level of clean. This is largely due to the First. Prof Jessica Green of U of Oregon’s work demonstrates that the “microbiome” of a mechanically ventilated building is less diverse and has a higher concentration of pathogens than on the human body and the landscaped exterior of such buildings. Killing everything, good and bad bacteria with the existing products and protocols extends this “indoor problem” rather than solving it. It is said that “We Humans are as Healthy as our Guts”. We take probiotics, say yougurt, to help improve our “gut microbiome” and so our health. Prof Green then concludes in one of her presentations that we should be looking for “Yogurt for our Buildings” to help create a “Healthier Building Microbiome”. Cleaning with the conventional combination of Physics (wiping, sweeping and vacuuming) with Chemistry (quats, bleaches, oxidizers et al) cannot achieve this, and it is being proven year after year, despite increasing the strength of the chemistry, in hospitals where HAI is proving a tragically stubborn foe. In essence we are using Physics and Chemistry to battle what is a Biological problem. The evidence suggests pathogens seem to be developing resistance to disinfectants in ways similar to that with antibiotics. To truly turn the table on HAI there needs to be a complete re-thinking of the problem. The “science” of Biomimicry, which has given us amazing developments such as self cleaning paint, offers a valuable insight: turn to Nature for inspiration as to alternative solutions. In Nature, there is a balance of good and bad bacteria. Probiotic Cleaners that deliver probiotic bacteria to the cleaning equation and utilize the principle of Competitive Exclusion whereby the probiotics out-consume the available food source and so the pathogens (including Superbugs) starve to death. This process is fast, and poses no risk of pathogens mutating as they do against disinfectant chemistry; (nothing has mutated to survive starvation). A Protective Layer of probiotics is left behind that inhibits the re-colonization of pathogens. It is a Biological Solution to a Biological Problem. For these reasons Probiotic Cleaners represent a cleaning technology that addresses the problem of HAI from a different perspective. They have been proven highly effective at addressing pathogen based problems (including Biofilm) in Agricultural Livestock facilities, Food Processing Plants, HVAC equipment, Assisted Living, Schools and Public Transport to name a few. Their proven performance warrants that they be given serious consideration as a viable addition to the conventional Physics and Chemistry approach, which continues to be limited in its success, is creating problems such as mutation of stronger pathogens, and increasing the incidence of people with chemical sensitivity. A question I leave this discussion with is why are Probiotic Cleaners not being given more serious consideration? Jon mentioned the need to consider ways of measuring cleaning. There is an old saying in business that “If it can’t be measured, it can’t be managed”. ATP has been used in independent comparative testing of the efficacy of Probiotic Cleaners; and not just by taking ATP levels before and immediately after cleaning. (Any disinfectant, sanitizer and or cleaner that doesn’t lower ATP immediately after cleaning shouldn’t be on the market). The real test using ATP as to the effectiveness of a disinfectant or cleaner is what does the ATP level look like 4 hours after cleaning (assuming no activity on the surface). Probiotic Cleaners have been demonstrated to keep ATP levels dramatically lower 4 hours and longer after cleaning that leading disinfectants and sanitizers. This represents a critical component of offering ongoing protection against pathogens which has to be crucially important to any initiative to reduce HAI. Graeme, what is your view on privacy curtains in this context?